But no one tells you how to do it! I love teaching investors and traders how to be successful. Especially when you can learn from my own experience so you can avoid costly mistakes and go straight for better profits. Everyone knows the most obvious way to profit in the market is to buy low and sell high. On a basic level, it makes obvious sense. Yet they never actually tell us how to do it consistently. It took me years of observing, trading, making mistakes, and testing to finally get it right. Now I have a systematic way of finding those stocks that are priced low right now, yet are ready to take off. Looking for stocks that are currently undervalued is called Bottom Fishing. It means pinpointing a stock that has fallen at least 20% off its recent highs due to broad market correction, sector correction, or deteriorating company fundamentals. It doesn’t mean the stock is bad. Instead, it shows us that there is a huge opportunity for the company to heal. When it does, the profits can be terrific. That’s when we begin looking for the ideal entry point. On a chart, this means we are looking for a trend reversal from down to up. But there are some tricky things to pay attention to, because doing it wrong can cause big trouble. This chart of AGCO shows how even the biggest companies trade in cycles. Toni shows you how to properly spot these bottoms and catch them at the right time for maximum profits. The good news is that finding and properly trading these bottom fishing strategies is easy enough for anyone who can follow my instructions. I show you exactly how to detect with high probability how a stock or ETF is just about to wake up from an extended downtrend and finally take off again. This is where the good stuff happens! I am a master of finding that precise moment in time, because bottom fishing has become my specialty over the past few years. Though every trade and situation is unique, it’s not uncommon for investors to make 10%, 20%, or even 30% in the upcoming weeksby following my clear strategies and letting your profits run. And when we see certain signals that the uptrend is about to end, that’s when we bag our profits. PLUS,we keep the profits in our pocket – and we don’t give them back. That’s what will set you apart from those other traders when you gain these skills. This is an easy-to-follow disciplined approach any investor can benefit from. If you can follow instructions and let the numbers be your guide, you can be successful with my bottom fishing strategies. It’s NOT a sign of serious trouble when stocks, ETFs, sectors, and even entire markets drop into these zones and go dormant for awhile. We know that the stock markets of industrialized nations move in cycles. They don’t move straight up forever. This is important to remember! Because it means they will all fall from time to time. So instead of worrying, we can look at it as an excellent opportunity to profit when they rise again – because they certainly will! Individual companies can slide on their own misfortune. For example, Apple and HP fell hard in 2010/2011. And if you knew what to look for you could have seen the clear signs to make 200% by 2013/2014. Before you jump into bottom fishing for yourself, you need to educate yourself on how to do it properly. That gives us a LOT of tools to analyze and pick winners. You’ll discover how to focus on the really big moves with the biggest potential paydays. Bottom fishing with my strategies done the right way can yield fantastic profits. BUT FIRST A WARNING: Do NOT jump into a stock that’s heading down just because you think it might rise again. After all, charts can give very confusing signals if you don’t know what to look for. These strategies are not difficult to learn. But you need to know the steps and what to look for to make successful trades. You can learn by trial and error if you want to. The best way to continue improving your trading and investing results is by adding to your education. Even professional traders like me are always sharpening our skills. That’s why “How To Bottom Fish Like A Pro” is so valuable to you. Because no matter what markets you trade, I am giving you proven strategies that will continue to bring in profits for you. In addition to all the How to Bottom Fish Like a Pro training videos, I want to give you some valuable gifts to show you how serious I am about helping you gain this knowledge and these skills for yourself . . . I've prepared handy How to Bottom Fish Like a Pro Course Manuals for you to keep at your side as you make a habit out of following all the steps to evaluate each trade decision you make to ensure that it's a solid, safe choice for you. 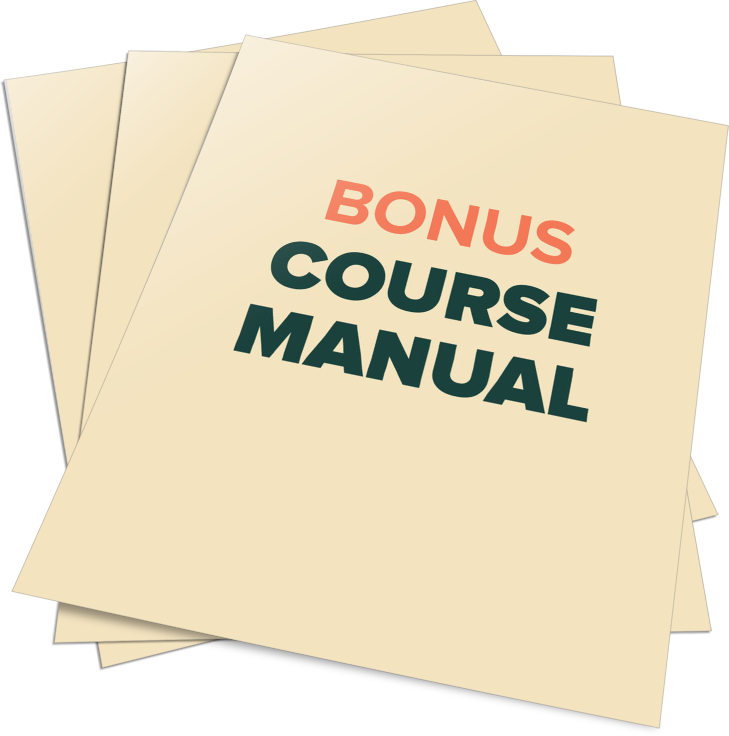 These Course Manuals are not available anywhere else. Much of your trading success comes down to how well you understand and retain the training you receive. 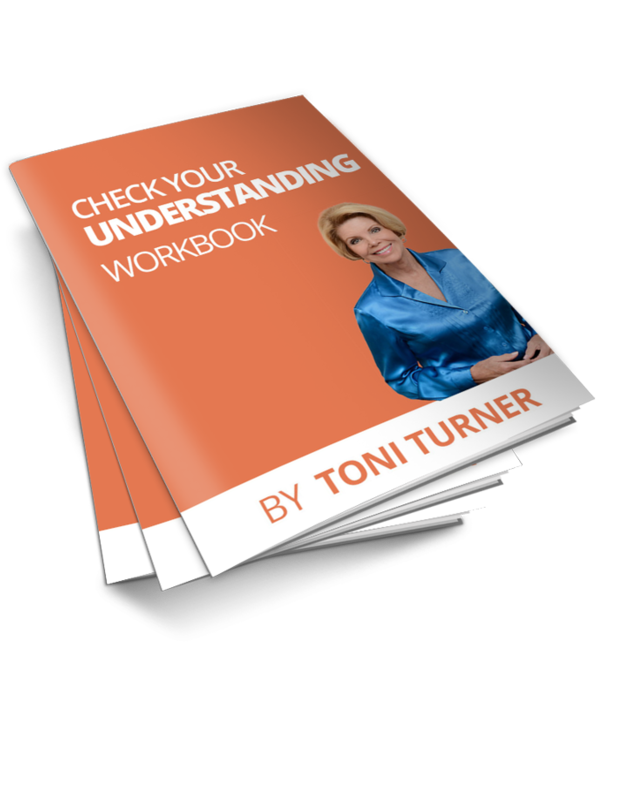 That’s why I created these valuable workbooks for you. It guides you through the information in a valuable question and answer format to help ensure you are understanding and absorbing the material. These ebooks are not available separately. 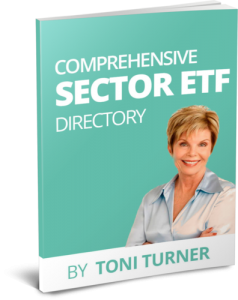 Jump-start your own ETF watchlist with this time saving directory. It will help you spot upcoming sector reversals and high potential trade entries. Not available anywhere else. Toni Turner is the reason why I have entered trading full-time. Her no-nonsense approach to capital preservation has given me the skills to stay in the game for the long run. I appreciate very much your [Toni Turner] willingness to teach us how to become successful traders rather than make us completely dependent upon you. So, thank you for your willingness to teach me your craft. And, you do it in such a kind and respectful way. When you register for “How To Bottom Fish Like A Pro” now, you will get instant access to your training for you to view as often as you'd like to keep you learning at a useful pace. These seven sessions will take you from a bottom-fishing rookie all the way to a knowledgeable, experienced trader. You will gain total confidence of banking potential massive returns from catching these bottom-fish stocks and ETFs just as they launch back into the stratosphere after being flat-lined for months. Imagine the profit potential of catching even just one great stock with these bottom fishing strategies. And you can put these strategies to work immediately. The regular price for this popular training course is $798. As a special offer, you can get immediate access to “How To Bottom Fish Like A Pro” for just $299. That’s an instant savings of 62%! But this is a limited-time offer, so you need to register now so you don’t miss out. It’s your opportunity to get these professional trading strategies right now. 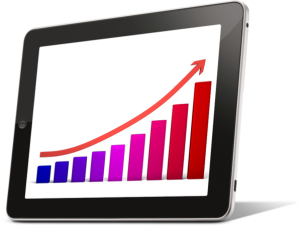 You’ll gain an advantage over your competition to generate consistent profits. I’ve found that the best way to teach these strategies to you is one-on-one through recorded video training sessions. It’s just me and you learning together in a fun, relaxed, and positive atmosphere of real learning. And I’ve put them all in a convenient online training center for you with private members-only access. Which means that you can watch them on your computer, your tablet, or even your smart phone. In other words, I’ve made it easy for you to learn my How To Bottom Fish Like A Pro training wherever and whenever it’s convenient for you. Because there are no scheduled classes for you to attend, when you register for How To Bottom Fish Like A Pro, you’ll have instant access to your training. And remember, How To Bottom Fish Like A Pro isn’t a stock picking service to show you what to buy. Instead, you get 100% education so you can gain the ability to evaluate trade opportunities for yourself and make intelligent decisions. Earn back your tuition with just one good trade . . .